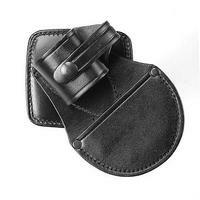 This is the best selling 3 position swivel pouch with double safety strap. The back has provision for two widths of duty belt. The 3 position swivel allows the law enforcement officer to have the speedcuffs vertical, 45 degrees or horizontal. The extra safety strap, when released allows better purchase to release the other fastener. A brilliant patented design.